The Arden Archives Photographic Collection is a collection of over 4,000 photographs. Many of the photos are searchable in our online database, and more photos will become available. 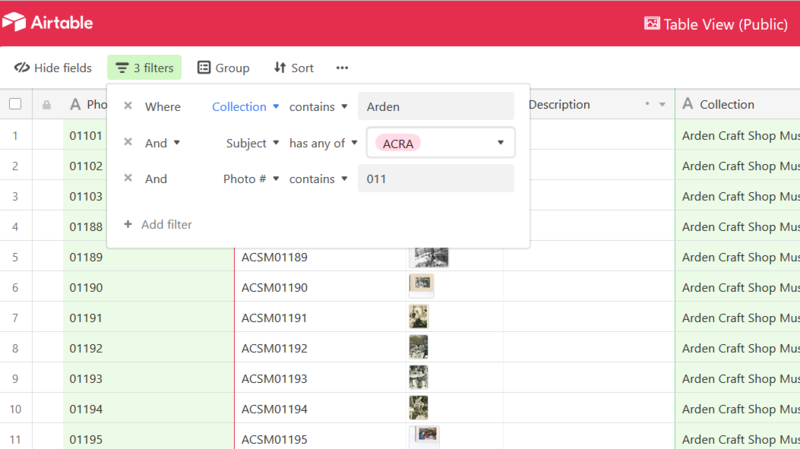 There are two ways to research in the database: you can browse through photos in the Gallery View or you can search for people, places, and dates using the Table View. For tips on using the search function, see below. ​For more information on researching and reproducing items in our collections, please see our Schedule of Fees​, Request for Reproduction, and the "Access and Use" section of our Collections Policy. 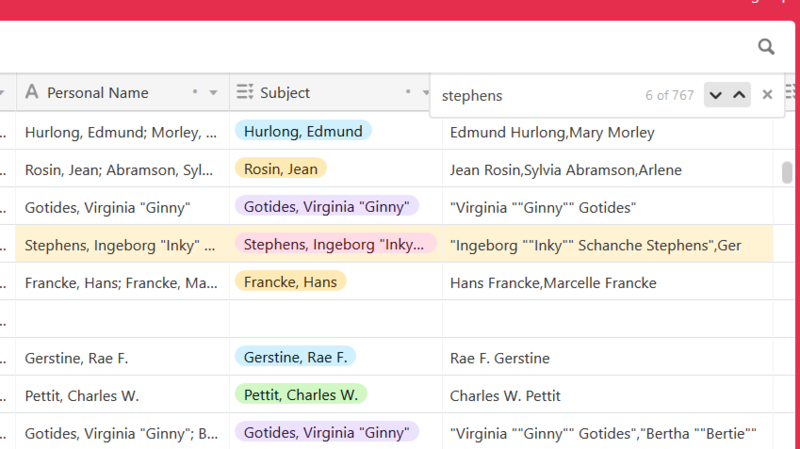 Because there are so many names in the Ardens (with a variety of spellings and arrangements), you may wish to view the lists of standardized names for people, places and events that are found in the database before beginning your search. The list of people is in alphabetical order by last name, but if you do not see the name you are looking for, keep in mind that many people in the Ardens had multiple names and nicknames throughout their lives. We have attempted to match the appropriate names together. To search for a term in the database, click on the Add Filters button in the top bar—this will filter out results that do not match your criteria. 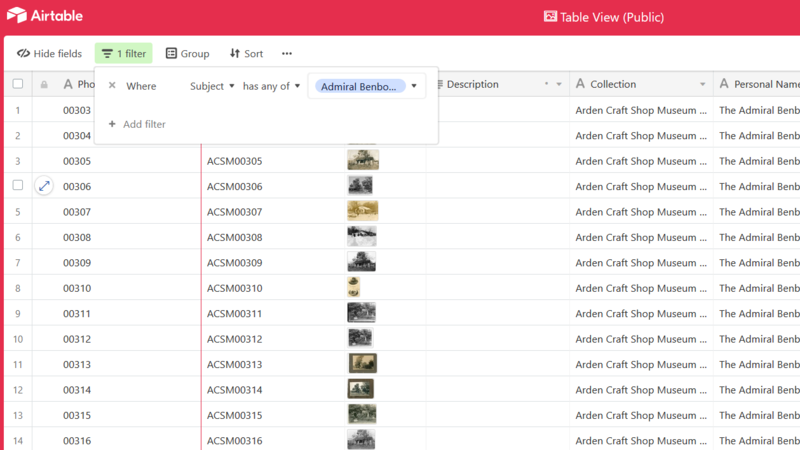 The searchable fields match the column titles (e.g., Photo #, Subject, Description). Select which field you wish to search (most often Subject), select a qualifier, and type in or select your search criteria. Give the table a moment to refresh, and then you will see all the photos that match your search filter. You can add multiple filters, though you may then need to close the filter menu to see the results. To perform a new search, you will need to clear any filters you no longer wish to use. When you first enter the expanded view, the image will be slightly cropped. Click on the image to make it larger. If you are interested in obtaining a higher resolution image of any of the photographs, please contact us at ardencraftshopmuseum@gmail.com. Different fields have different search methods. For example, the subject field allows you to select subjects from a pre-existing list (alphabetical by last name). Please note that when searching for a term in the database, you will only find exact matches to your query (though it is not case-sensitive). For example, if you are looking for the name “Ware, Hamilton D. ‘Buzz’”, you can search for “Buzz” or “Ware” or even “Hamil” but you will not get the intended results if you accidentally search for “Wear”. Remember to remove the filters before starting a new search. You can also use the magnifying glass symbol in the upper right-hand corner of the screen to search, but this will not eliminate records that do not match, it will only highlight one at a time the fields that do match. 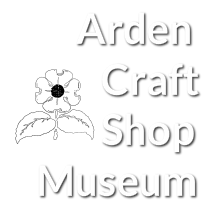 If you are interested in obtaining a higher resolution image of any of the photographs, please contact us at ardencraftshopmuseum@gmail.com.